CloudPad One Tablets With Marshmallow OS Goes On Sale, All Down To Under 2.5K Pesos! Home / cloudfone / mobile / news / CloudPad One Tablets With Marshmallow OS Goes On Sale, All Down To Under 2.5K Pesos! After successfully updating the CloudPad One series to the latest Android 6.0 Marshmallow OS, CloudFone has another sweet treat for everyone. This time, we got a word from one of our readers that he spotted those devices with HUGE price cuts. The 3 items that will be on sale are the: CloudPad One 6.95, CloudPad One 7.0, and CloudPad One 8.0 tablets. The CloudPad One 6.95 that has a 6.95 inch IPS display and runs with 1.8 GHz Intel Atom quad core processor and 1 GB RAM. From the regular SRP of 4,499, you can now purchase it for 1,999 Pesos. On the other hand, the CloudPad One 7.0 is a bigger tablet with 7 inch IPS XGA screen, 1.8 GHz Intel Atom quad core processor, 1 GB RAM, and 5 MP main camera. 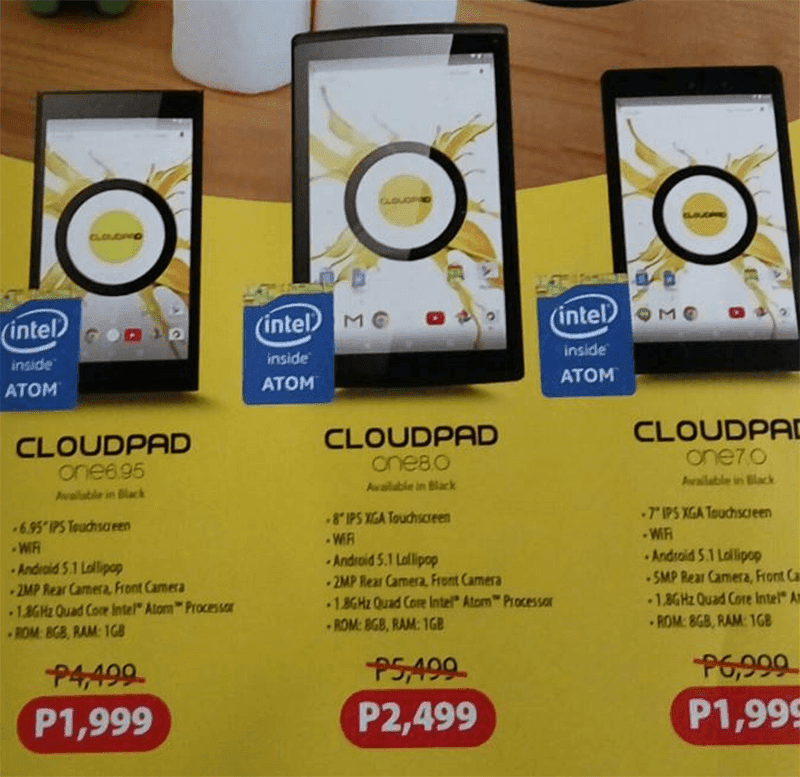 From 6,999, the CloudPad One 7.0 is down to just 1,999 Pesos. The bigger CloudPad One 8.0 is included in the promo too. It has nearly has the same config compared with the first 2 tablets, except that it has a bigger 8 inch IPS XGA panel. From its old SRP of 5,499, it is now available for purchase at just 2,499 Pesos. Given those new price tags, the CloudPad One series now loads with even better value for money than ever. Thanks for the tip Tep Mendoza!